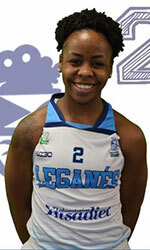 SPAIN-- Imani Tate and Ynsadiet Leganes (19-7) are playing their best basketball at the right time. 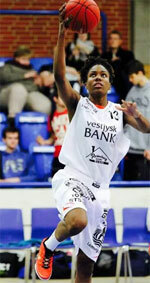 In the regular season finale, Tate had 18 points and nine rebounds in a tough win over Movistar Estudiantes, 85-79, Saturday in Group B of Liga Femenina-2. Leganes, the winners of five in a row, already qualified for the promotional phase had to dig deep to pull the game out. With the regular season coming to an end, Leganes will play in group 1 of the promotion phase that will take place from April 25 to 28 in the Juan Rios Tejera pavilion in La Laguna (Tenerife). Celta Zorka (24-2, 1st of the group A), the host City of the Adelantados (22-4, 2nd of the group B) and the Barca CBS (17-9, 4th of the group A) round out the set. The second group is composed of Campus Promete (24-2, 1st group B), Patatas Hijolusa Leon (21-5, 2nd group A), Anares Rioja (18-8, 3rd group A), and CB Almeria (16-10, 4th group B). The tournament will be played in a round robin format with each team playing each other in each of the two groups with the top two teams will qualify for the semifinals. The semifinals will be FIBA's famous crisscross where the winner of group one will be take on the second place finisher in group two and the other semifinal will pit the winner of group two to take on second place finisher of group one. The two winning teams of these semi-final matches will be playing next season in the Spanish women's First League. BOONE, N.C. - North Texas couldn't have asked for much more when it came to the opening moments of the Women's Basketball Invitational final. By the time Anisha George (188-C-98) scored in the paint late in the first quarter, UNT was up 12 on Appalachian State and appeared to be well on its way to another milestone in a season full of them. That early lead and the opportunity to win the first nonconference postseason tournament title in program history slipped away quickly in a 76-59 loss Wednesday at the Holmes Center. The Mean Green went cold offensively, couldn't maintain their terrific play defensively from the first three games of the tournament and saw a historic season end in disappointing fashion. UNT had never won a postseason game beyond a conference tournament before ripping off three straight wins in the WBI to reach the final. UNT (18-16) just couldn't convert against a red-hot Appalachian State team that entered the night having won nine of its last 11 games. The Mean Green advanced to the WBI final largely because of the way they played defensively throughout the tournament. UNT allowed 54 points or fewer in each of its three wins. Appalachian State converted a three-point play at the end of the third that put the Mountaineers (22-14) up 58-44.